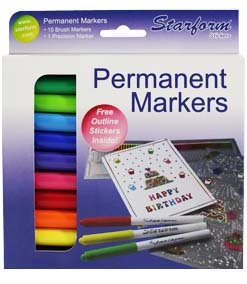 Starform Outline Stickers gold: 114, 1004, white, orange, pink, light blue: 1082. Card: soft pink (13x13 cm). Cut out a square opening (9,2x9,2 cm) from the card and stick transparent plastic sheet behind it. Colour broad sticker borders red on the sticker sheet and stick them right and on the bottom of the soft pink square that was cut out of the card. Stick 5 more red coloured borders horizontally and vertically with 1,3 cm space between them. Successively stick the pink, light blue, white and orange sticker borders in the same pattern as shown in the example. Stick the square on the inside of the card behind the opening. 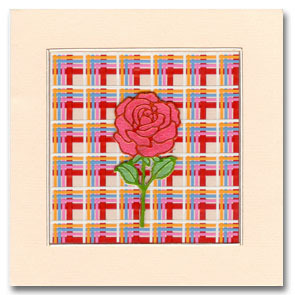 Colour a rose red and green on the sticker sheet. Stick it on white metallic cardboard, colour it, cut it out and stick it on the middle of the transparent plastic sheet. Finish the opening of the card with a small sticker border.